We are offering Upgradation of Universal Testing Machinesto our clients. In the wake of technological advancement and automation, existing mechanical dia type universal testing machines are getting obsolete. Moreover it takes plenty of time for testing. Plotting of graph of required test in different units is still more difficult. Evaluation of important parameters like proof stress, Young's modulus is very tedious and time-consuming. 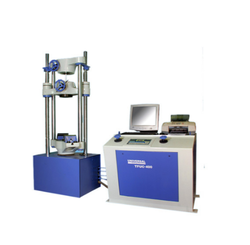 The company has developed the most user-friendly and precise electronic measuring system for universal testing machines. Results available in required SI units along with the graph. Customized printing/ result format on the computer. We can undertake up gradation of any make machine provided that the existing machine is in working condition. The power pack, crosshead movement, jaws, inserts and all such components/ assembly should be in working condition. After the upgradation of the machine into computerized version, the accuracy of the machine will remain same as that of before conversion. Looking for Upgradation of Universal Testing Machines ?